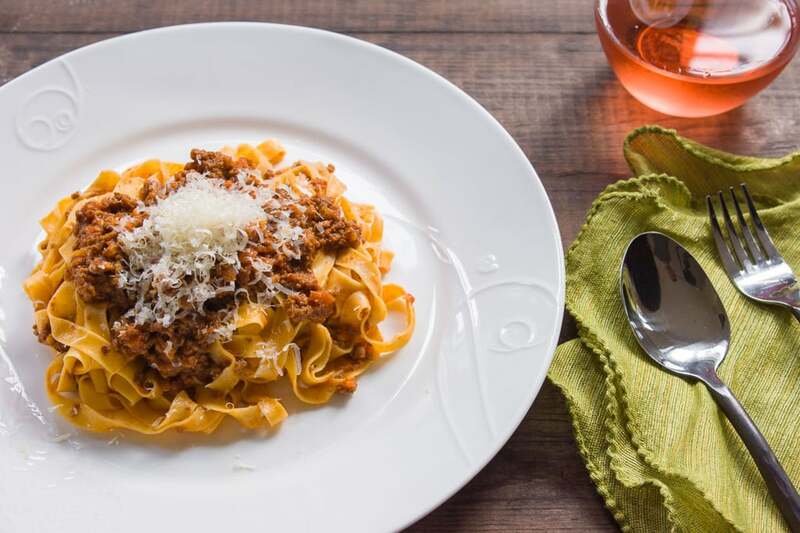 Ragù Alla Bolognese is a delightful slow-cooked meat sauce from Bologna that goes beautifully with some fresh tagliatelle. Between a crazy work schedule and an unusually warm autumn, a lot of what I’ve been doing recently has been quick and relatively easy. 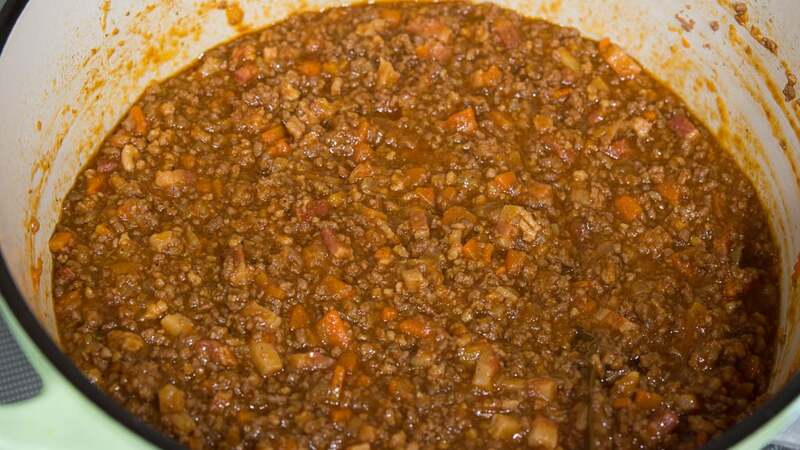 But with a sudden drop in humidity, and a chill that’s settling in for the winter, I found myself with a bit of time and a big desire to tackle a project that I’ve been meaning to do since I shared my Quick Meat Sauce recipe three years ago. 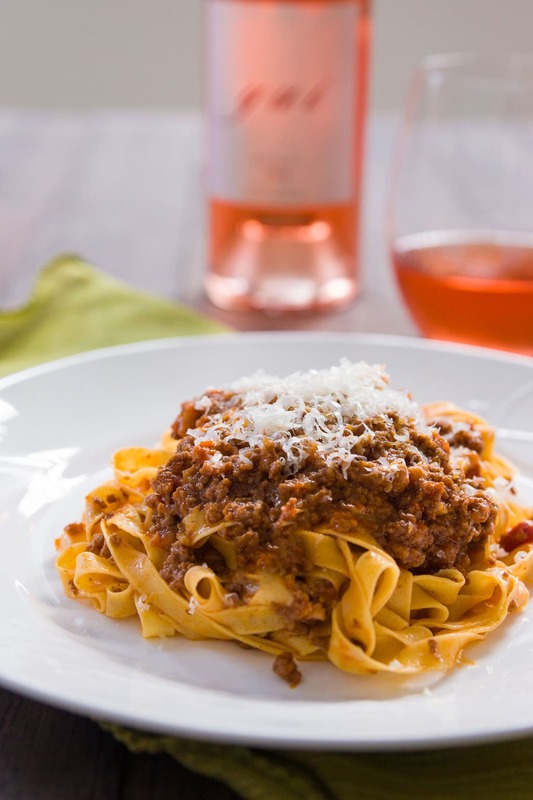 A real slow-cooked Ragù Alla Bolognese… or at least my version of it. If you’re living in the US, then you probably associate Ragù with a brand of jarred sauces owned by a Japanese company, and Bolognese with a meat sauce that’s served with Spaghetti, but in Bologna (or more specifically Imola) where Ragù Alla Bolognese is thought to originate, it’s a local meat sauce that’s almost always served with tagliatelle. If you think about it, it makes a lot of sense, as the flat noodles are much more adept at hanging onto the tender bits of minced meat in their loops and folds than slick, cylindrical spaghetti. 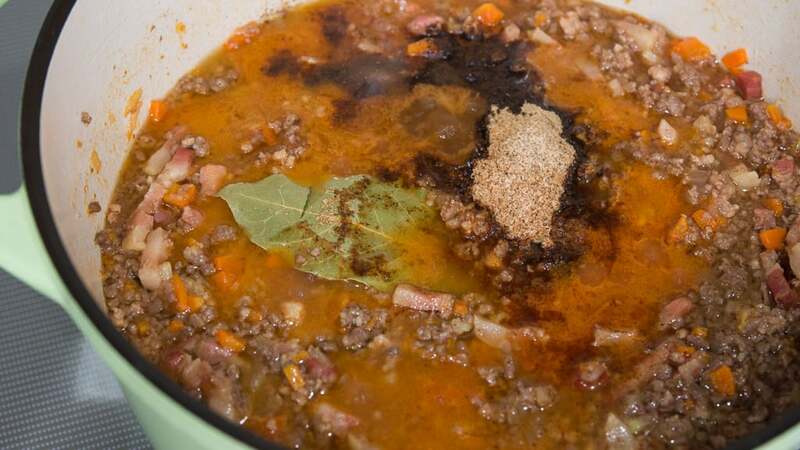 The ingredients and methods for making ragù vary widely depending on where you happen to be in Italy, but regardless of where you are in the “boot”, it’s always a sauce where the primary ingredient is meat. In fact many regions don’t even add tomatoes to the sauce, and the regions that do (like Bologna), use tomatoes as a seasoning rather than the base. 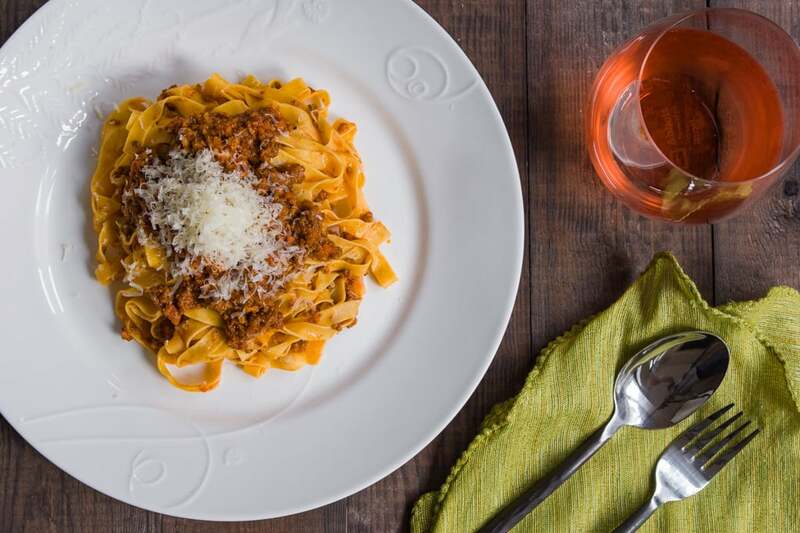 Put another way, Ragù Alla Bolognese is not a red tomato sauce with meat in it, it’s an earthy burnt-umber meat sauce with a little tomato flavor. I know these photos are probably making you pretty hungry, but before you decide to tackle this project, make sure you have a bit of free time as this really is a project. With an hour of active prep and cooking involved and another two hours of passive cooking, you should plan to spend the afternoon in the kitchen. That said, there’s nothing difficult about any of the steps and you’ll be rewarded with a truly hunger-inducing aroma that smells exactly how you’d imagine an Italian nonna’s country kitchen would smell after a day of cooking. Meaty and complex, and yet warm and sweet, it’s the kind of aroma that makes me want to snuggle to it, if such a thing were possible. 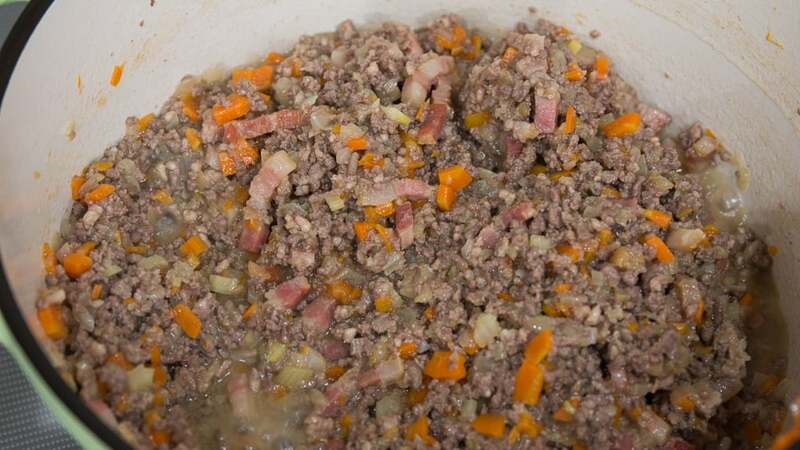 Place a heavy bottomed pot such as a dutch oven over medium-low heat and then add the pancetta. 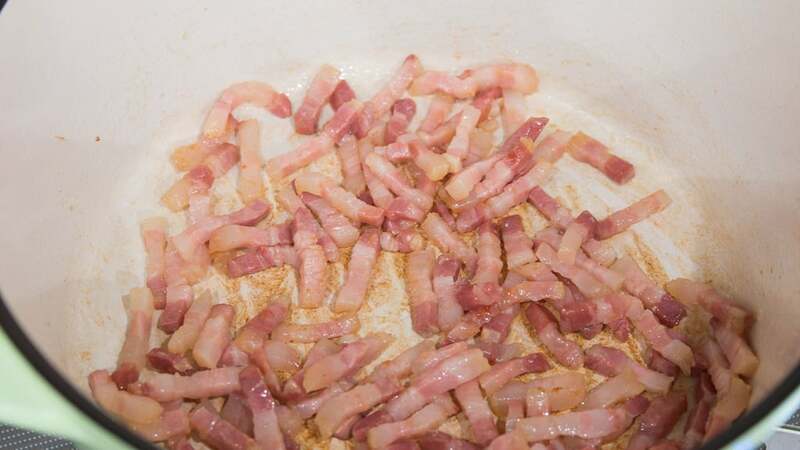 Once the fat starts to render out, turn up the the heat and fry the pancetta until cooked through and starting to brown. 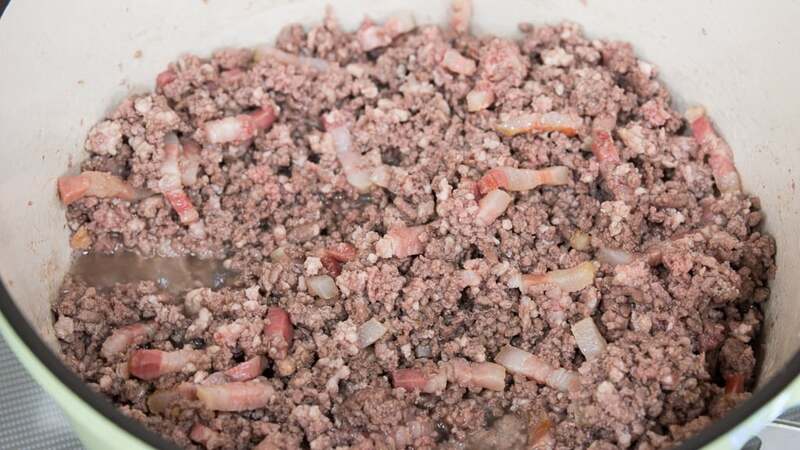 Add the ground beef and pork and fry, crumbling the meat with a spatula until the meat is cooked through. 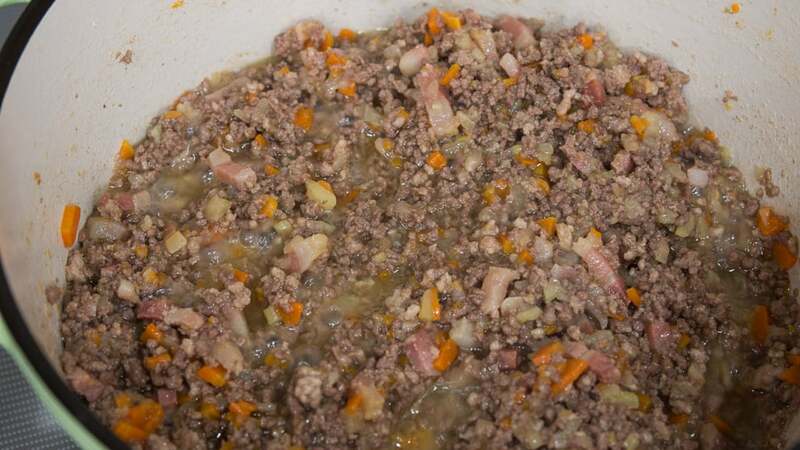 Transfer the meat to a bowl, leaving behind as much of the fat in the pot as possible. 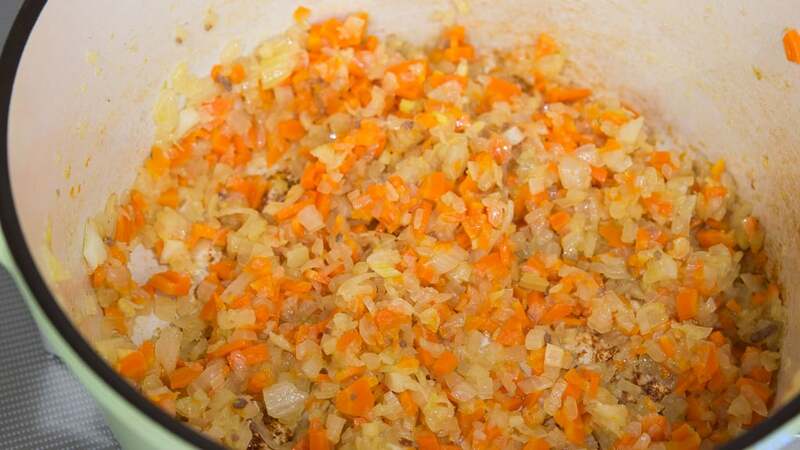 Add the onions, carrots and celery and cover with a lid. Turn down the heat to medium low and steam the vegetables for 10 minutes. Remove the lid, turn up the heat to medium-high, and saute until the liquid has evaporated and the vegetables start to brown (about 10 minutes). Add the milk and then return the meat back into the pot. Simmer the milk until it's mostly evaporated (about 10 minutes), stirring from time to time to prevent burning. Add the wine and continue simmering until most of the wine has evaporated (about 10 minutes). Add the tomato juice, porcini powder, nutmeg, black pepper and bay leaf and stir to combine. Cover the pot with a lid and then turn down the heat as low as your stove will go. Simmer covered for 1 1/2 hours, stirring occasionally to prevent burning. If the sauce gets too thick and starts sticking to the bottom of the pot, add a bit of water. Add the tomato paste and continue cooking uncovered for another 30 minutes, stirring frequently to prevent burning.